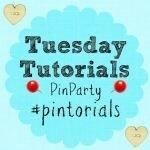 A huge welcome to Week 17 of the Tuesday Tutorials Pintorials Pin Party! This week I am featuring three hanging crafts! The first craft I am featuring is from our fellow team members Kate from Craft On Sea. She made a beautiful Seashell Wall Hanging. Next is a sweet and beautiful Summer Ribbon Wreath from Snapshot and Snippets. Lastly this is from Dwell Beautiful, a quick and easy monogram craft that will brighten your front door! Why not pop by to take a look at Gude (I crafts for kids), Kate (weekend project) and Anna (animal crafts) featuring who this week?